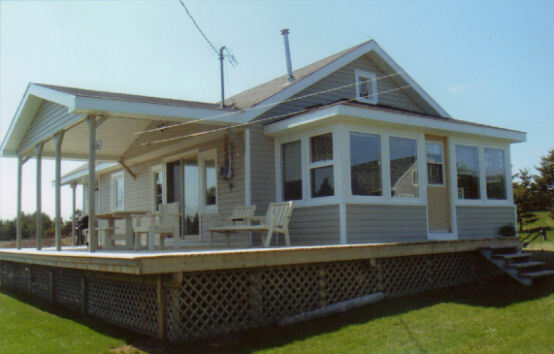 Relax in the sunporch or on the deck and enjoy the view of the water. Visit nearby Basin Head Fisheries Museum, hike on the Confederation Trail, go deep sea fishing or golf at the Rollo Bay Greens. East Point Lighthouse and Elmira Railway Museum are also just a few miles away. 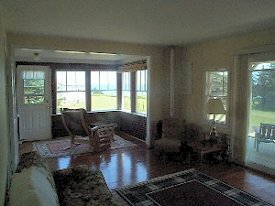 30 minutes to Links at Crowbush Cove or to the Brudenell Golf Course and 60 minutes to Charlottetown. Red Point Beach and the Magdelen Island Ferry are both a short distance away. From Souris, continue east on Route 16 for 10 km (6 miles). 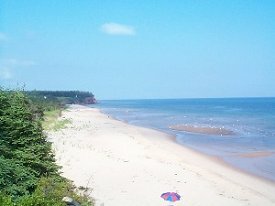 Red Point Provincial Park will be on your right and just past there you make a right on Sandy's Lane. Follow road to very end and make a left on Cranberry Lane. MacKinn"Inn" is right on the corner. Click here for an area map. Click here for area information.. Living room and sun room combines to make a 25 foot by 12 foot room. Deck runs along front of house and has an overhang. Newly renovated bungalow with 1100 sq. feet.